CC Hunter's Reborn is Out Tomorrow! I have the greatest, most dedicate fans in the world. I have been especially blessed lately because I have been able to meet even more of my fans this past year than usual. And Iâ€™ve loved every minute of it. You guys are fantastic at promoting my books. So, when you read Reborn, and if you like it, donâ€™t forget to spread the word. There is no greater recommendation for a book than by word of mouth. And if you are a blogger feel free to post a review or contact me at cc@cchunterbooks.com for an interview. Now, itâ€™s almost May 20, and Reborn will be out tomorrow. Della will be getting in and out of trouble, and youâ€™ll be able to read all about it. Della really has her hands full in Reborn, and Chase gives Steve a run for his money when he puts the moves on the smart-mouthed vampire. I am working on writing Dellaâ€™s second book, Eternal, and I can tell you that things are getting even worse for poor Della. I have cried and I have laughed and I canâ€™t wait for you guys to read whatâ€™s going to happen next. Of course, most of you havenâ€™t read Reborn yet, but letâ€™s just say in Eternal Chase is the one giving Della havoc. So if you are already a Chase fan, youâ€™ll look forward to this book. Tell your friends if they preorder Reborn before it is released May 20, you can get a copy of Shadow Falls: The Beginning absolutely FREE. How? Well, St Martinâ€™s just needs to see a copy of your receipt for Reborn, and theyâ€™ll send you Shadow Falls: The Beginning, which contains Born at Midnight and Awake at Dawn, the first two books in my Shadow Falls series. Did I mention it was FREE? And this deal isnâ€™t only for US residents, but for residents of Canada (except Quebec) also. How cool is that? Some of my fans are buying an extra copies and using them for birthday or Christmas gifts. Click here for more information. learns a secret about her fatherâ€™s past that blows her away. offers her own soul to save two people she cares about dearly. is reminded of the essential value of friendship. And thatâ€™s just a few things that happen in Reborn. Not to mention Holiday and Burnett have their much anticipated baby! SO be sure to preorder your copy BEFORE May 20th to get a FREE Copy of Shadow Falls: The Beginning, or wait till itâ€™s release and pop into your nearest book store. Speaking of book stores, Sunday June 1st at 2:00 I'll be at Katy Budget Books in Katy, Texas. I'll be signing with two of my other favorite Young Adult authors, Joy Preble and Sophie Jordan. Then, on June 14th, I'll be signing at Barnes & Noble in Pasadena, Texas with a whole boat load of other paranormal authors. Don't miss it! 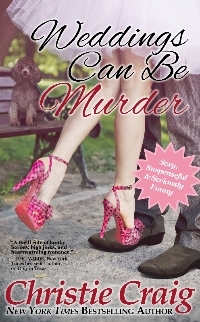 Oh, and have you read my Christie Craig romance Weddings Can Be Murder? Well, right now, Weddings is up for FREE at all the e-book retailers. It has gotten a whole new cover, and as an added bonus, youâ€™ll find the first 45 pages of Reborn at the back. So go snag a copy if you havenâ€™t read it. And hereâ€™s to happy reading!